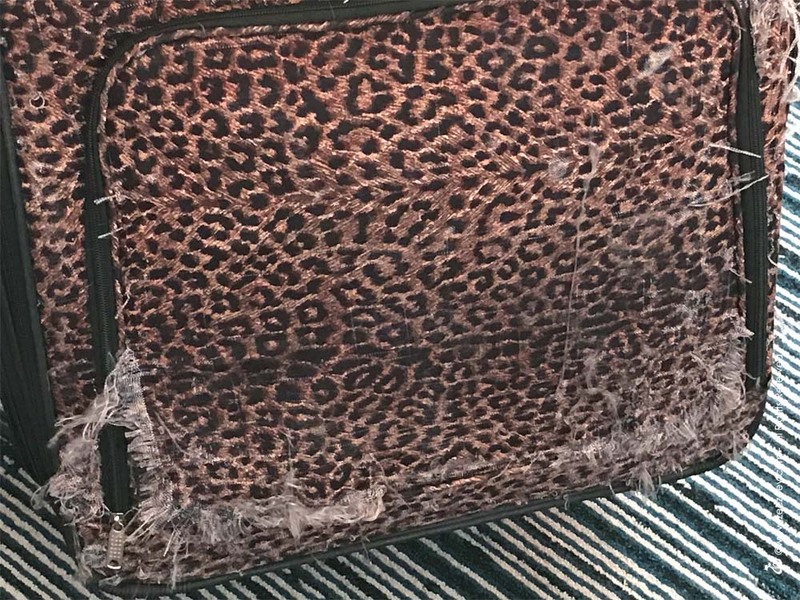 Sure…my luggage might have a few love scratches and frays from my cats, but as long as the contents are less than 50 pounds, I don’t care! Hey everyone! 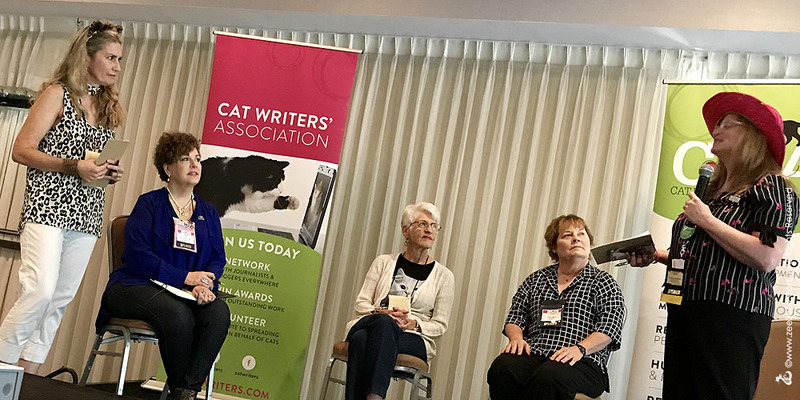 I had wanted to do a recap of my experience attending the 24th annual Cat Writers’ Conference and Awards Banquet last June 7 – 9 in Houston, TX. From start to finish it was a perfect alignment of the sun, moon, and stars. I remembered to pack my razor and phone charger. I had pre-TSA check-in at the airport. My luggage was less than 50 pounds and my hair was uncharacteristically cooperative during my stay. The conference itself was amazing. Actually one of the best conferences I’ve ever attended in my whole cat-writing career. 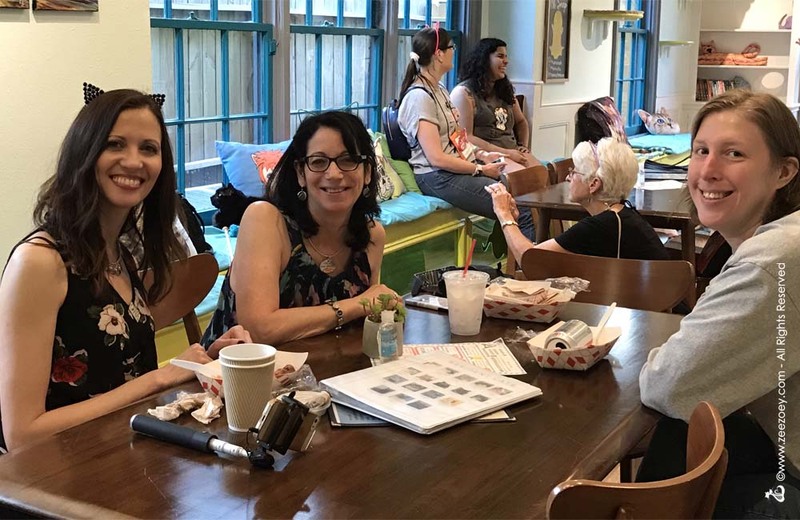 The atmosphere was intimate enough that everyone really got a wonderful chance for networking and bonding without feeling left out or overwhelmed. The informative sessions were planned so there were no overlaps and people didn’t have to make the agonizing choice of choosing one over another. Our keynote, Dr. Marty Becker of *Fear Free Pets, was a wonderful combination of inspiration, humor, and education, and my debut as a panel moderator wasn’t as bad as I thought. Sure, I got tongue-tied now and again, but for the most part, I was able to overcome my stage fright. Opening the conference and moderating the “Research – First, Last, and Always” panel with Amy Shojai, Patricia Fry, Arden Moore, and Lea-Ann-Germinder. Dr. Becker during his inspirational and informative Fear Free Pet Keynote. 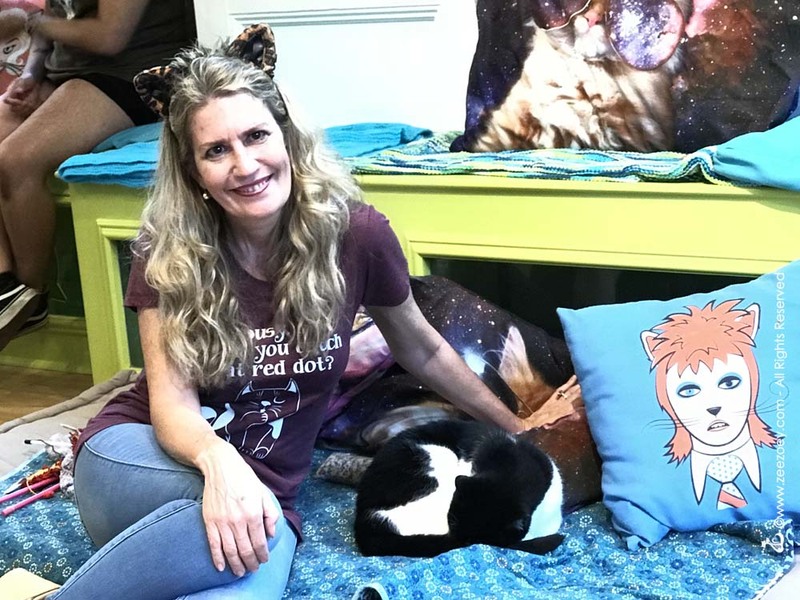 We also had lots of great outside activities, like our Friday night evening at the super-cool El Gato Coffeehouse and Cat Café and a book signing table at the Cat Fanciers Association Cat Show that was being held in tandem with our conference on Saturday. 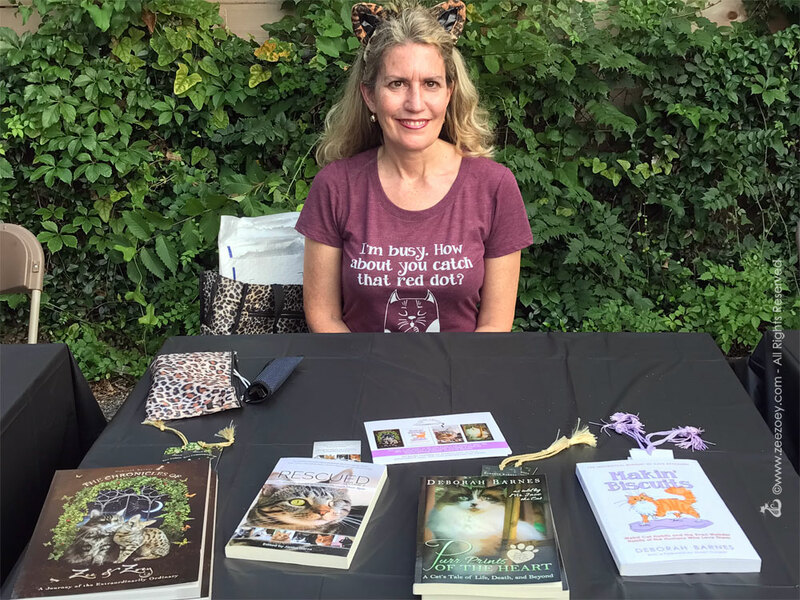 Hanging outside the El Gato Coffeehouse and Cat Cafe for a fun evening and book signing event! Just when did I find the time in my life to write 3 books and a feature story for another one?! Having a fun photo-op with the owner of the El Gato Coffeehouse and Cat Cafe, Renee Reed. I love that her place helps raise awareness on cat rescue and that her cats are also available for adoption. Wow! Look at this super-cool artwork featured inside the El Gato Coffeehouse and Cat Cafe! 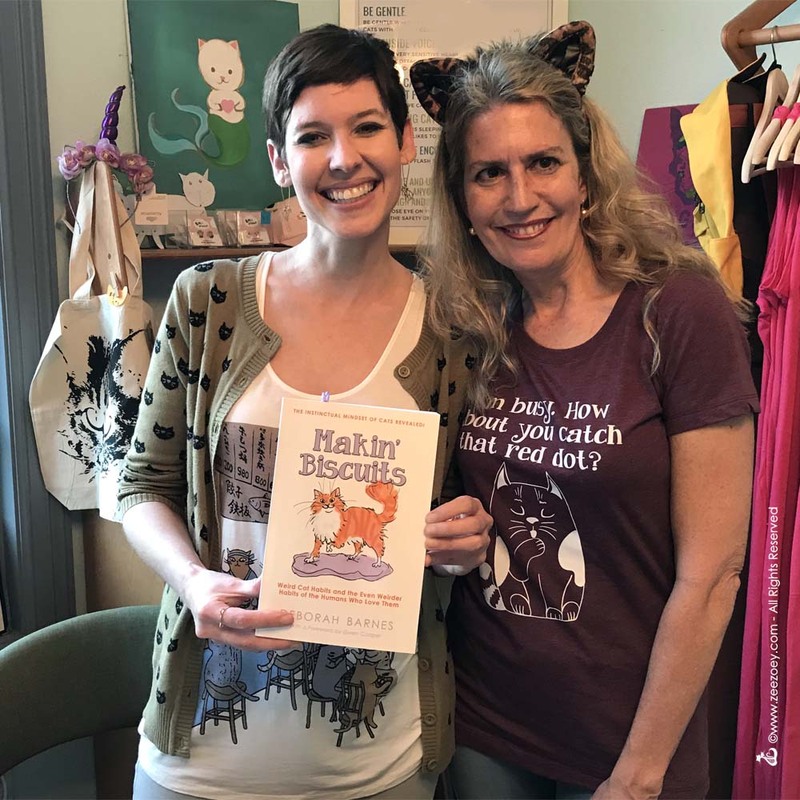 Some of my favorite cat ladies hanging out at the El Gato Coffeehouse and Cat Cafe. 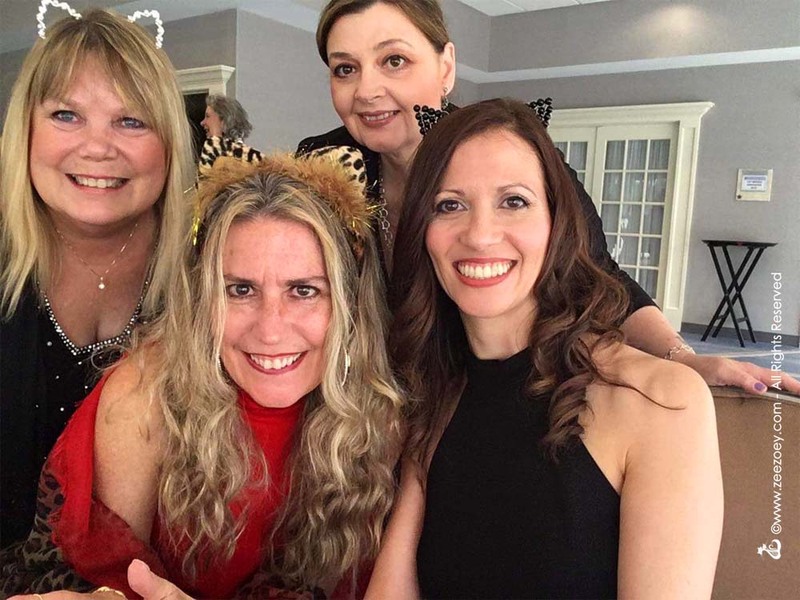 Yasaar Nakchbendi, Susan Willett, Patricia Fry taking a photo, and Katherine Kern. 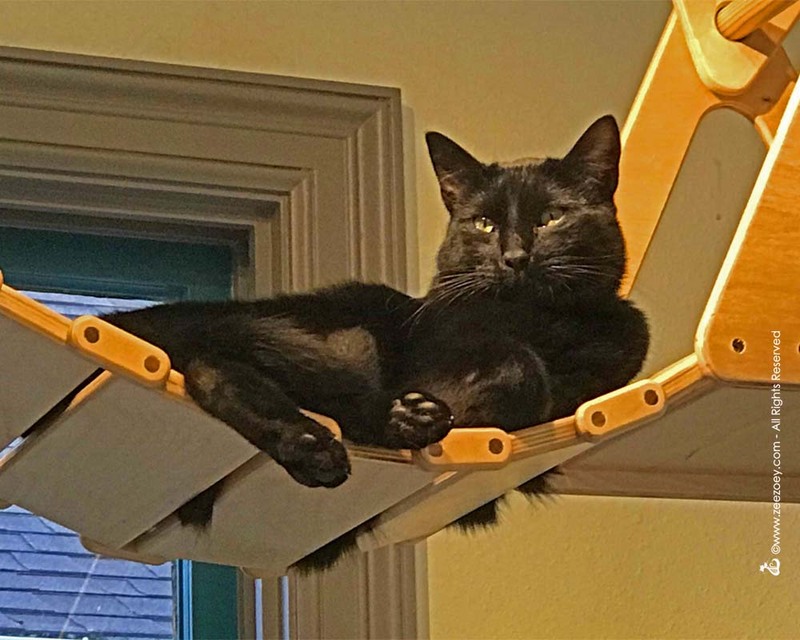 One of the gorgeous black cats available for adoption at the El Gato Coffeehouse and Cat Cafe. I’m in my element – hanging out with one of the cats up for adoption at the El Gato Coffeehouse and Cat Cafe. And then there was the awards banquet Saturday night. This was a surreal moment for me from start to finish. 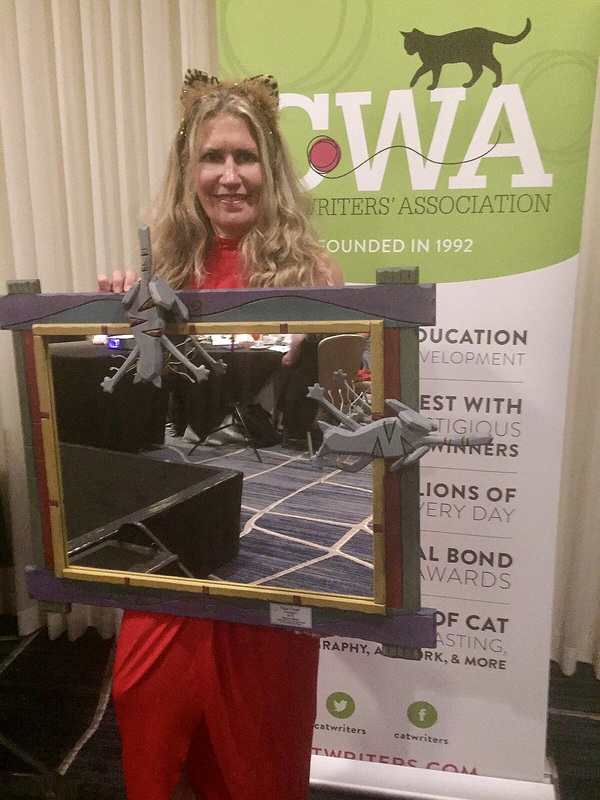 First off, I was presented with the distinct honor of winning the Fear Free Pet Enrichment Award for my article, “Is Your Cat Feeling Stir Crazy? 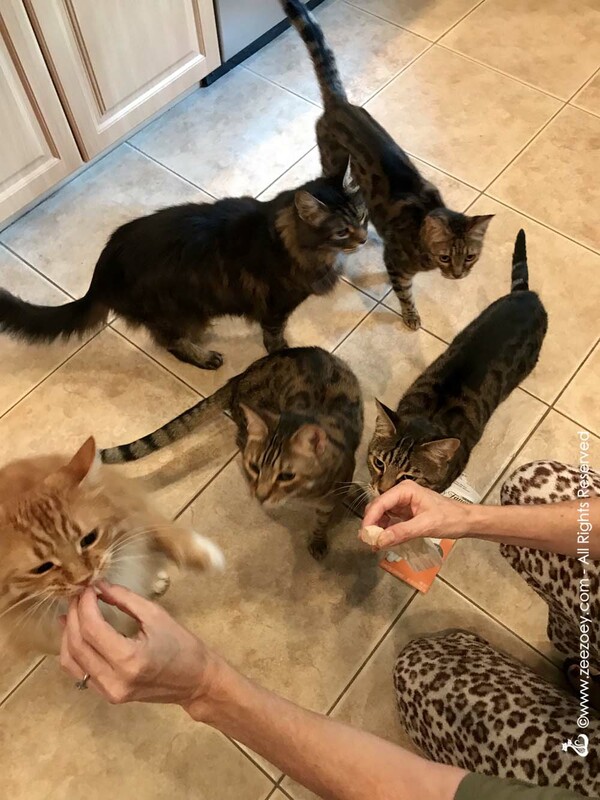 10 Tips to Relieve Feline Boredom in an Everyday Environment” as written for Zee & Zoey’s blog, but even more surreal, was being passed the gavel from CWA President, Marci Kladnik, to me, now the new CWA President. 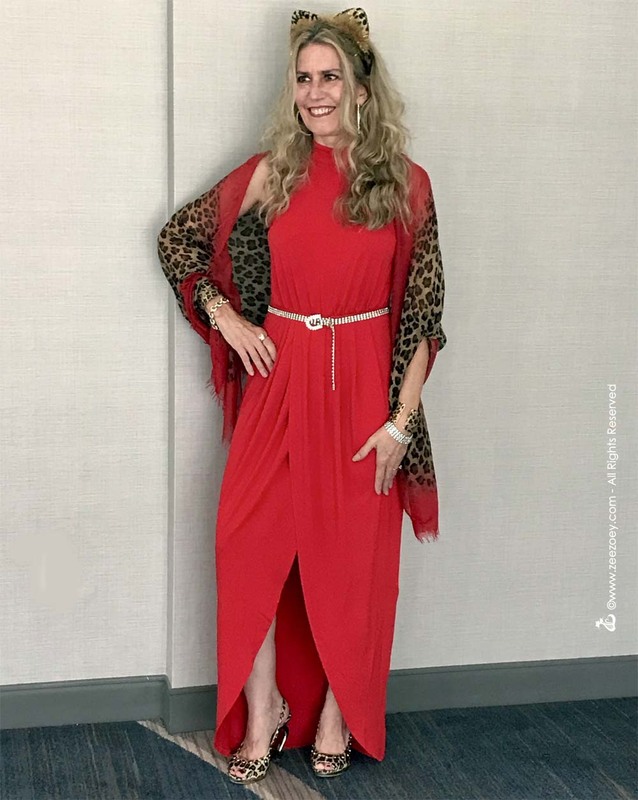 I had shared with everyone I was having difficulty finding a leopard print dress for our awards banquet – I settled on going as a lady in red with leopard accent and loved the look! Hanging out with our new CWA Vice-Prez, Paula Gregg andTreasurer, Dawn White, as well as the multi-talented Yasaar Nakchbendi. This breath of fresh air with me is Jessica Spawn, a soon-to-be member of the CWA. 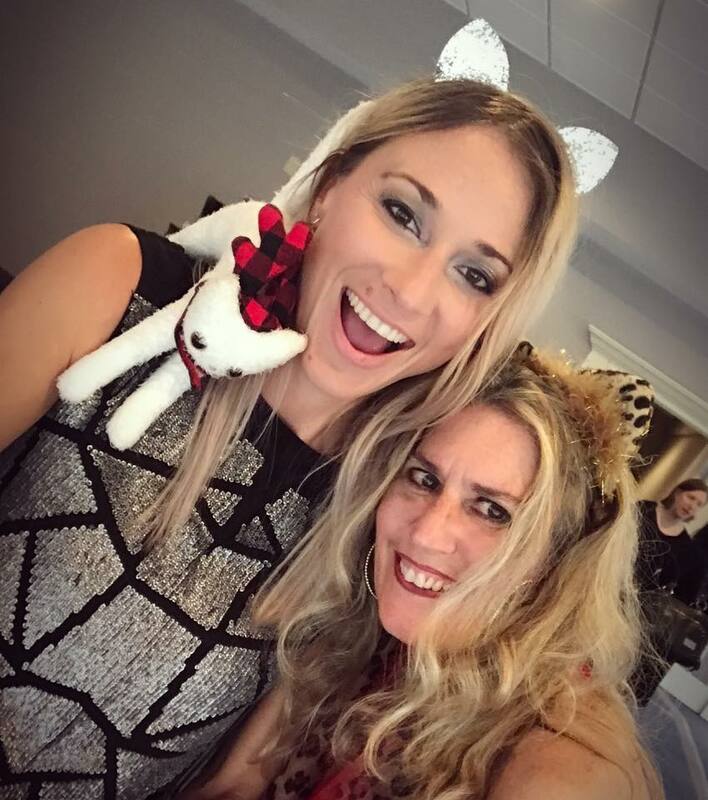 Jessica is a true social media diva and is also the author of The Christmas Kitten. 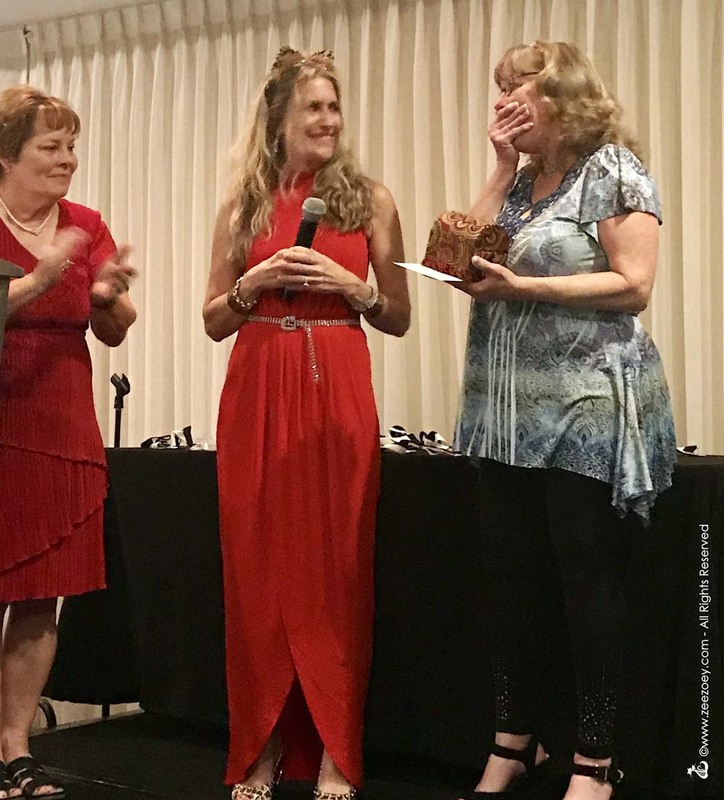 Accepting my Fear Free Cat Enrichment Award – quite a humbling moment! It was quite emotional for both of us. I will be forever grateful to Marci for stepping into the role of President under difficult circumstances when our President, Lorie Huston unexpectedly passed away on September 30, 2014. It wasn’t always easy for Marci, I know because I was by her side for most of it, and she did her level best to stabilize our organization and move us forward. Presenting Marci Kladnik with a beautiful custom-made necklace from fellow CWA member, Wendy Christensen, before Marci gets ready to pass the presidential gavel on to me. My recap all changed, however, when I became quite sick last week and was bedridden nearly all of Thursday to Sunday. I’m still quite weak, and to top it off I have vitrectomy surgery confirmed for this Tuesday to remove a wrinkle pucker that has developed in the retina of my left eye. I’m trying to remain calm, but honestly, I’m terrified. The recovery could be intense and I’ll probably be off the radar for some time. For someone who has a day job, a new role as CWA president, and relies on social media to promote her business, I know I’m going to instantly be drowning in catch-up work. As it is, I’m already drowning and I haven’t’ even had the surgery! But, oh well. Time has proven over and over again that the world continues to rotate on its axis regardless of my schedule. What’s most important is my recovery and health and if I can’t get everything done in the timely manner I want to, not only will I have to deal with it, but so will others. I’m grateful to have Dan, my family, and my kitties by my side to help me through it all. And I know all of my wonderful blogging and cat friends will understand as well. I will keep you all updated as best I can, in the meantime, I hope everyone is doing well and any prayers and purrs you can send my way would be greatly appreciated. Oh, and P.S. 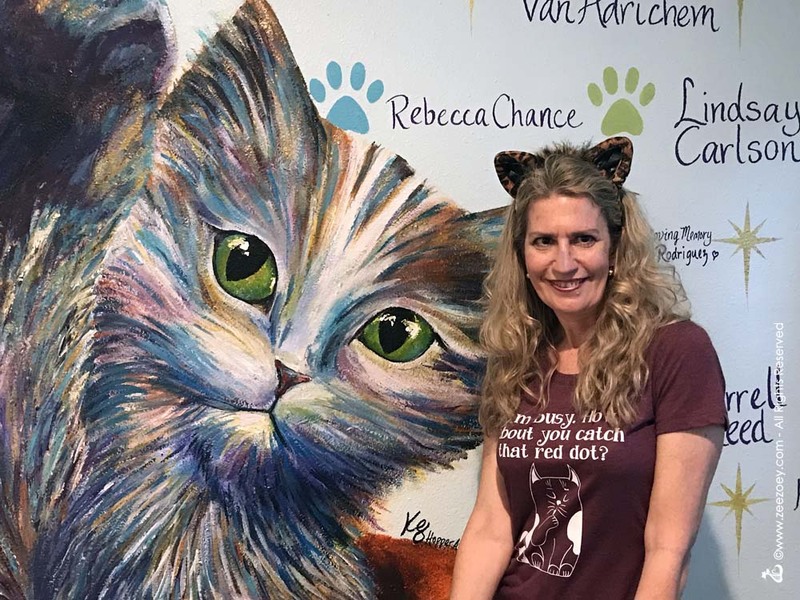 – if you like the T-shirt you see me wearing, you can find it here at Zee & Zoey’s Cat Creations. I’m a little nervous about my surgery, but as long as I have my sweet kitties to help me recover, I should be in good paws. 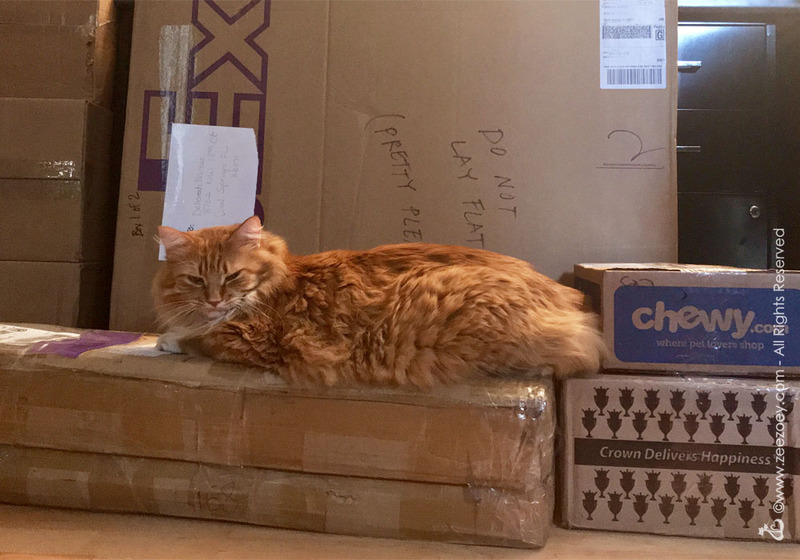 This is them enjoying some swag I brought home from the conference. *For those that would like more information, or would like to become certified, Fear Free provides online and in-person education to veterinary professionals, the pet professional community, and pet owners to provide learners and pet lovers with the knowledge and tools to not only look after a pet’s physical well-being, but her emotional well-being as well. 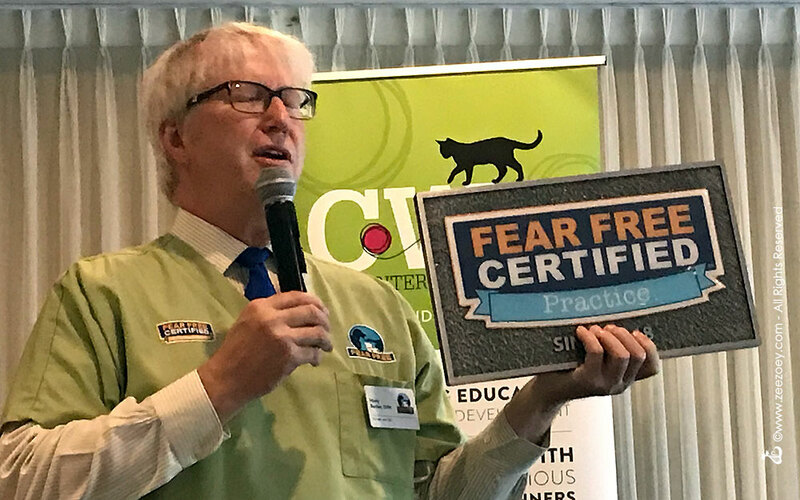 Founded by “America’s Veterinarian,” Dr. Marty Becker, Fear Free has become one of the single most transformative initiatives in the history of companion animal practice, with over 31,000 veterinary and pet professionals committed to becoming Fear Free certified. Please click here for full details. What a splendid report and I wish I could have been there! I know you will od us proud as top Cat at the CWA. We hope your surgery was successful, and that your recovery is going smoothly.